During a recent Gallery Walk, the public could watch artist Carol Arnold paint a portrait in the front window at 24 High Street, the studio home of High Street Painters. EDITOR'S NOTE: Area resident Andrea Scheidler has formed an artist support and study group of realist painters from throughout New England. On November 6, she welcomes the public to 24 High Street to meet members of the High Street Painters and enjoy their Small Works Show & Sale. My studio is one of a small group of spaces in Brattleboro (among them, the studios of William Hays and Mallory Lake) where artists paint very seriously in a realistic or figurative tradition. What is unique is that the artists at High Street Painters and I are, at least for the present, doing this in plain view of the public. In this way, I hope to sensitize viewers to, and educate them on, the process involved in producing a painting. Many people picture the artist's life as a cloistered existence, imagining that painters and writers lock themselves away in order to contact some higher power or muse. This is not my experience. My experience with myself and with many others is that the artist's muse is always present. It is present morning, noon, and night at convenient and at inconvenient times! Closing myself away from others only becomes a necessity in order to explore an idea I may have been holding in mind and heart for weeks, months, or even years. An idea may float as easily in the mind as a feather on a stream. Bringing it to shore and possessing it can prove to be difficult. Some inspirations are fugitive visitors: mirages that vanish just when you get close enough to touch them. Ruined canvases, torn papers, these are the refuse of a journey that few artists want others to see. To spend hours or days making something ugly or clumsy in pursuit of beauty is a painful experience, especially in a country where time is money and art is your vocation! There are many long hours and years that must be devoted to mastering the skills and tools of an artist. (I compare it to learning to become a brain surgeon.) The training involved in learning to represent a vision or idea in a way that causes an art connoisseur or a passerby to stop and dive into your painting, is a never-ending process. A few weeks ago renowned Santa Fe artist Albert Handell was teaching at Village Arts in Putney. He talked about the endless learning process of an artist this way: "There is no Z in this alphabet." 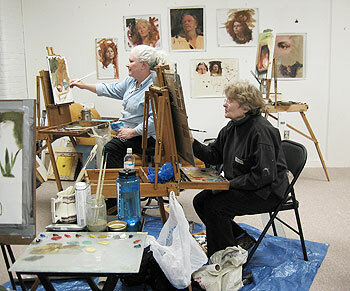 Catherine Nunn and Mariette Sanders work on their canvases surrounded by inspiration. The secretive nature of the artist's journey encourages the idea that artists are a special breed endowed with gifts that others do not have. While it is true that some artists have unique vision and imagination, Edisonís old adage about genius being "10% inspiration and 90% perspiration" is the truest thing that can be said about mastering the craft of being an artist. I undertook the High Street Painters (HSP) project in order to share a view into the life of an oil painter. I wanted to demystify the art process. The building I am in houses many artist studios. For the past four months, artists and friends have been coming to my studio on the first and third Wednesday of the month to paint in the great room off the main hallway. Many of them drive three hours or more to Brattleboro! Located on the main level of The Midtown Mall, High Street Painters is a closed studio with windows onto the world. Painters have joined me there in order to experience community and to learn from each other. Some are fairly new to oil painting, some are established artists with studios of their own. 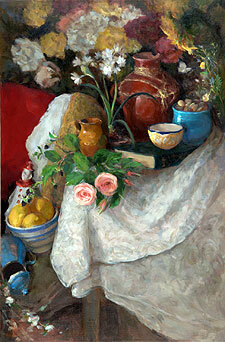 Most paint landscapes and still lifes and want to study portrait painting. Twice in the past year, we have been privileged to study with a master artist from Chicago's Palette and Chisel Academy of Fine Art. * Richard Schmid is one of the most influential representational painters alive today. He and his wife, artist Nancy Guzik, have lived quietly in the area for over ten years. The author of numerous books for artists and a prolific painter, Richard has mentored and inspired artists from around the world for more than fifty years. He and Nancy currently mentor a group of artists at Village Arts of Putney called Putney Painters. I have been a member of that group since 2001. Although Putney Painters is a closed group, Village Arts hosts open workshops with many other fine artists (www.villageartsofputney.com). In addition to learning from each other, HSP provides a needed "family" of like-minded friends. Sometimes we even sing and dance to shake off the muscle aches that can come from hunching over our work. 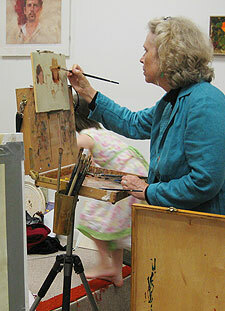 Once Nancy Guzik came to the studio to paint Putney Painter Carol Arnoldís children, and some HSP members were there. There was a lot of learning during that time! And I loved to see faces watching through the hall windows. Although we have a few workshops each year, most seats are filled by members of HSP -- the last workshop had three seats for non-members. Visiting painters are welcomed into the group as space allows. High Street Painters meets formally twice a month. The rest of the time, we work on our own projects. You can observe me and guest painters through windows into the studio on Monday through Friday, catch as catch can. 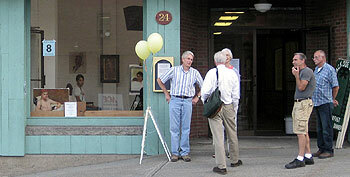 High Street Painters does not have a formal gallery but serves as a site for collectors to contact member artists. We had our inaugural group show at Vermont Artisans in July and will open the HSP studio for our first Small Works Show & Sale during Gallery Walk on November 6. During November, visiting Chicago artist Juan Ramirez Jr. will be painting still lifes and portraits in the studio. He will also have paintings available for purchase. If you would like to model for a portrait by Ramirez in exchange for a digital image of the painting, please contact me at 802-387-4550. Connecticut: Pamela Reese, Nancy Howell, Susan Jositas, Muci Clemens, Julie Hopkins, Gladys Freyer; Massachusetts: Robert Watkins, Carol Arnold, Jonathan Stasko, Judy Greulich, Linn Bower; Vermont: Andrea Scheidler, Catherine Nunn, Jan Brough, Karen Winslow, Mariette Sanders, Susan Bull-Riley. Andrea Scheidler is a longtime Windham County resident. She studied art at Windham College in the late '60s and early '70s with David Rohn and Peter Forakis. 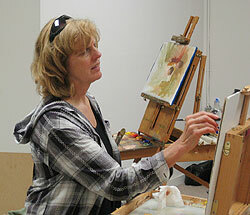 She credits local artist David Rohn with instilling in her a sense of the importance of drawing skills. Andrea began oil painting in 2001, when she was invited to paint with Richard Schmid and Nancy Guzik at Village Arts of Putney. Andrea shares that "Richard and Nancy are creative geniuses, master painters, and generous teachers. They have inspired and helped me in so many ways. I have tried to raise awareness for the fine representational art skills they teach by teaching others and by helping out at Village Arts. Village Arts is the hub of Schmid's teaching and an exciting place for artists to study with painters like Dennis Sheehan, Albert Handell, Jack Keledjian and Diane Rath. Many members of my studio group have also studied with teachers in the great old barn on Westminster West Road. Then they come to the studio to share and practice what they learned at Village Arts and from other workshops with their fellow High Street Painters. It is the best of both worlds." Andrea is a member of Putney Painters, The Portrait Society of America, Palette and Chisel in Chicago, and is the founder of the High Street Painters project. She describes her work as "lyrical realism." Andrea's paintings may be seen at Susan Powell Fine Art in Madison, Connecticut on the Internet, and on her Facebook page. 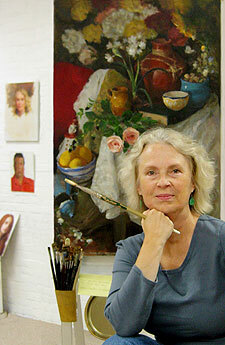 Her paintings are in private collections in the U.S., Canada, New Zealand, France, and England. Visit High Street Painters by appointment or look through the hallway windows. Contact Andrea at highstreetpainterst@yahoo.com or 802-387-4550.